Flooding is an international issue. In the last month, there have been flash floods in Coverack, Cornwall and in Paris 27 days of rain fell in one night. In Japan, nearly 400,000 people were evacuated following torrential rain and in north east India, nearly 2 million people have been displaced and over 80 have died as a result of flooding. We know from our experiences in England that the devastation caused by flooding to families and local communities can be near unbearable. This is why we are always learning and sharing with partners around the world to improve how we protect people. Our local flood defences are stronger because of international expertise. The Dutch are world famous for flood and coastal risk management. With much of the country beneath sea level (in some places up to 6 metres) and its great cities within the deltas of four major European rivers, The Netherlands is a near-miracle of human endeavour and centuries of engineering. In the last ten years, the Dutch have experienced eight of their ten largest recorded rainfall events. At Deltares, the independent institute for research on deltas, coastal regions and river basins, experts used to think the most immediately apparent impact of climate change would be rising sea levels, but now they think it will be heavy rain. This is one of the areas where the Dutch authorities want to learn from the Environment Agency. In England, we too have seen an extraordinary series of record rainfall events in the last ten years. Beginning with the extraordinary summer floods of 2007 right up to the winter of 2015/16. We still have a lot to improve on following these incidents, but they have taught us lessons that many others want to learn from. Last week, I met Dutch experts keen to find out about our approach to flood and coastal risk management. It was good to see some familiar faces because I visited The Netherlands earlier this year to find out more about theirs. Across the North Sea, the size of the “Delta Works” flood defences that protect the coast is awe inspiring. Hosted by Rijkswaterstaat, I visited the Dutch Storm Surge Barrier. 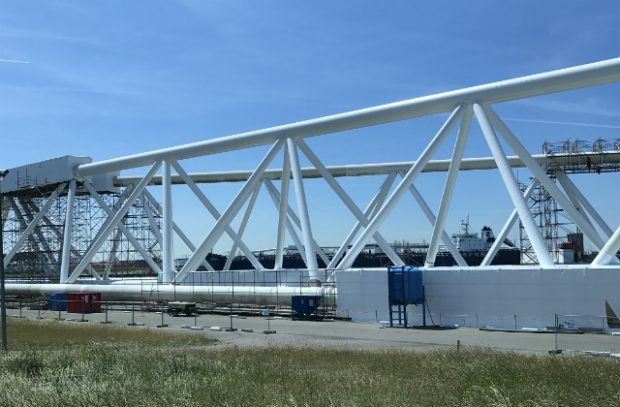 Maeslantkering is made up of two 6,800 tonne gates which are each nearly the size of the Eiffel Tower and require half an Olympic swimming pool of paint to keep them pristine. The gates rest on either side of the channel that allows ships in and out of Rotterdam Harbour. When operated they take half an hour to swing together over the river and then two hours to sink to the bottom to protect against storm surges – it has only been operated once as the result of a big enough surge (on November 8 2007), but by 2050 they expect it to be in use every 5 to 6 years. Even in The Netherlands the pool of experience for operating a structure like Maeslantkering is small and the ability to learn from others is limited, so together with our team at the Thames Barrier they formed the International Network for Storm Surge Barriers (I-STORM). 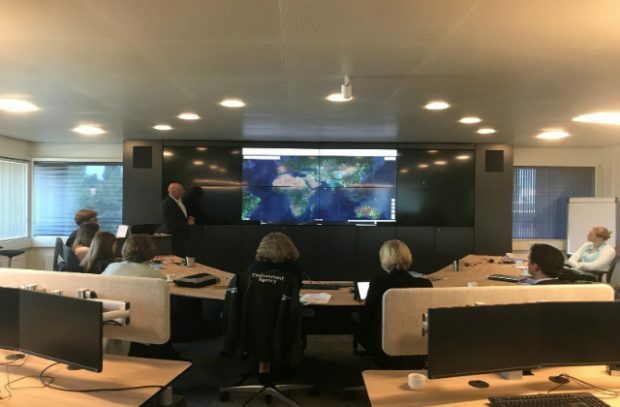 Along with the Environment Agency and Rijkswaterstaat, I-STORM allows organisations operating storm surge barriers in different countries (other members include the Venice Water Authority and the US Army Corps of Engineers) to share best practice, peer review each other and strive for excellence. We are also learning about natural flood management together. The Dutch are experimenting with river widening and have a significant programme called “Room for the River”. Natural Flood Management schemes are also being used to make the famous sea defences more resilient without building ever higher dikes. At Hondsbossche Dunes I saw this for myself. I met members of the local water authority (Hoogheemraadschap Hollands Noorderkwartier) who explained to me that dunes have additional benefits: they are adaptable to climate change, support tourism and the local economy. Similarly, at Scheveningen Beach near The Hague, the innovative one kilometre long “underground dike” reduces wave sizes from eight meters to two metres while providing locals with a delightful beach. At Deltares’ facility in Delft near The Hague, I saw the “Delta Flume”, a vast structure where experts test the effect of waves on dikes, dunes, breakwaters and offshore structures at full scale. They hope to soon be able to enhance the evidence base for natural flood management by testing the effects of vegetation in the flume. This is just a snapshot of the things we are learning together. 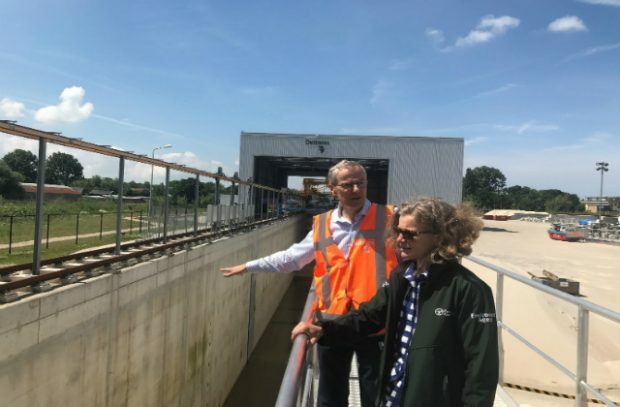 Our partnership with different flood defence bodies in The Netherlands is part of an ongoing conversation involving our two countries, and many others around the world. International collaboration and partnership in flood management is essential. We may not be able to precisely predict the weather events of the future, but we can prepare ourselves better for different scenarios. Benefiting from international expertise helps us to do that more effectively. For that I say “dank je wel”.